We are experienced in assisting government agencies and municipalities through the lifecycle of their capital improvement projects beginning with planning and entitlements through final construction. We have helped clients develop athletic fields, award winning regional parks, schools, and medical clinics, military installations, as well as an array of commercial and industrial sites ranging in size from less than one acre to more than 80 acres. Our ability to deliver successful and cost-effective projects has allowed us to enjoy long standing relationships with many of our clients. Since May 1989, R.O. Anderson has assisted Douglas County School District with nearly all of their civil engineering and land surveying requirements. These services have included complete design, environmental permitting and project management of an extensive list of construction and capital improvement projects. Management responsibilities have included development of plans and specifications, oversight of the bidding process and pre-construction meetings, review of construction schedules, resolution of field issues, management of payment and bond release requests, and coordination of change orders. During the permitting process, R.O. Anderson has been responsible to apply for and obtain the requisite permits of numerous state and local agencies, including TRPA, Douglas County, East Fork Fire, Tahoe-Douglas Fire and Nevada Division of Health. 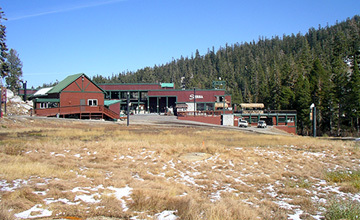 Sierra At Tahoe Ski Resort is located on U.S. Forest Service land, south of Hwy 50, and east of the town of Twin Bridges in El-Dorado County, California. The USFS parcel encompasses a very large area, but the Base Area Plaza project will disturb less than 4 acres. 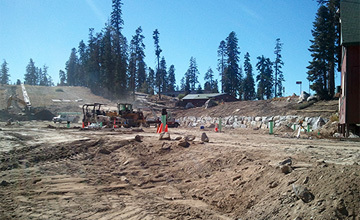 Sierra At Tahoe is improving the area adjacent to their main base lodge with a paving stone plaza area, a new 9,000sf structure and associated improvements. Prepare the civil design. The project was shelved for funding reasons prior to obtaining a construction permit. In 2013 the project was given new life and we prepared revised plans for the site, grading, storm drain and utility improvements, as well as coordinating the structural design of CMU and rockery retaining walls. R.O. Anderson also designed appropriate temporary and permanent BMPs to address stormwater within the project area, prepared a SWPPP, and coordinated permitting through regional and state regulatory agencies. Preparation of the SWPPP and permitting assistance through the Regional Water Quality Control Board (RWQCB) was included as part of the design services described above. 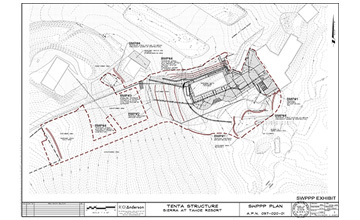 Upon calculating the Risk Assessment R Factor, we determined that this project was eligible for the waiver, therefore, the project was not required to be covered under the Statewide General Permit, and a formal SWPPP was not required by the RWQCB. We prepared an abbreviated SWPPP for Sierra at Tahoe to include in their construction contract. The SWPPP provided direction to the contractor on how to comply with the County’s erosion and sediment control standards.